In search marketing, we’re obsessed with making things “findable.” We spend our days creating content and inventing campaigns to connect customers with what they’re looking for. It’s no secret that big brands can have problems making their content “findable”- after all, they’ve got a lot of material, and it’s hard to prioritize what should come first. But I recently encountered an excellent example of poor indexing by a major brand- NBC.com. obsessed with copyright laws). 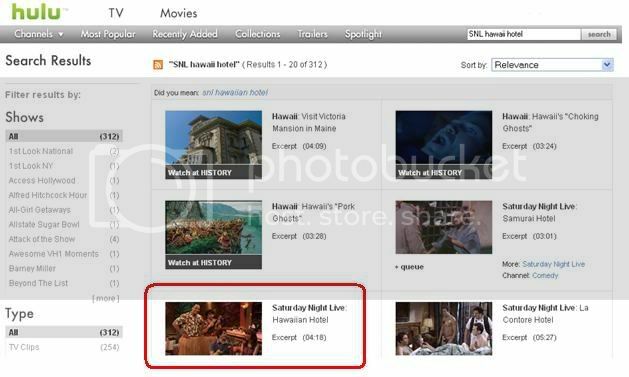 I searched for the phrase “SNL Hawaii hotel” and what did I get? It’s there, but barely above the fold. Why does NBC.com even offer searches for videos and hosting video content if they own Hulu? Doesn’t it just seem redundant? Why isn’t my result first on the page? It is the only result that matches all of the keyword intent in the query, but it’s 5th. Furthermore, it’s an NBC show, so I’d expect it to be given some sort of weight there. As search marketers, we can learn a couple of valuable lessons from this little exercise. Remember that your customers want to be able to go to one place to find something. If Hulu wasn’t owned by NBC, NBC would have lost me as a viewer after I left NBC.com. I’m not sure if they wrote it off on their end, saying, “well, the content we don’t have on NBC.com will most likely be on Hulu, so we’re covered,” but as a user—that’s annoying. If you’re working with offline content, make sure that it has some “sticky” phrases. If I hadn’t remembered that the skit took place in Hawaii, my Hulu results would have been dramatically different. Say, for example, that I didn’t remember Dwayne Johnson’s real name, but knew that he used to be called ‘The Rock’ in professional wrestling. What would happen if I searched accordingly? Remember, kids: people often search using their memory and associated ideas. Plan accordingly.